You believe “I am not a Language/Athletic/Math/etc… person”. You, or someone you know, wants to become the best, or even just better at anything. You’re fascinated by the psychology of learning; be you learner, teacher or parent. “Bounce” is a book for anyone who believes they are “not a Language / Athletic / Math / etc… person” and never will be. This slight shift in perspective makes all the difference. Syed’s athletic career adds depth and colour to his conclusions. His evidence base is full of cutting edge research, interviews, and historical fact. His suggestions are immediate and practical. 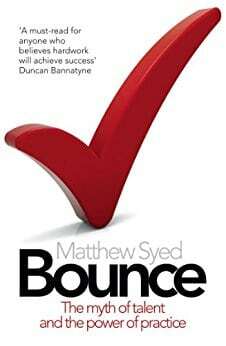 then “Bounce” is be a compulsory addition to your already bursting bookshelf. Its insights will surprise, entertain and inform you. They may even change your life. In learning, people tend to adopt either a “Fixed” or “Growth” mindset. The “Growth Mindset” more accurately reflects what we know about learning today. And yet we still use the comfortable “Myth of Talent” to make sense of the world around us. Even though it is based on partial and inaccurate information. And grossly distorted by our cognitive biases. This is important because our expectations have great consequences for ourselves and those around us. Mindset: a “Growth Mindset” gives us a love of learning and a resilience to failure. Motive: an “Internal Motive”, once sparked, sets intention and sustains drive and motivation. Practice: “Purposeful Practice” with enough quantity, quality and feedback, is the bedrock of ability. Opportunity: “Good Luck” in Where, When, What, Who and How separates the top 10% from the top 10. Managing “Belief” is a final “X Factor” in balancing conflicting demands of “Learning” and “Performance”. In conclusion: Your most basic abilities can be developed to extraordinary levels through dedication and hard work. Do not let the “Myth of Talent” hold you and the people around you back. People believe their basic qualities, like their intelligence or talent, are simply fixed traits. They spend their time documenting their intelligence or talent instead of developing them. They believe that talent alone – without effort – creates success. People believe that their most basic abilities can be developed through dedication and hard work. They understand that brains and talent are just the starting point. This view creates a love of learning and a resilience that is essential for great accomplishment. Between domains: Growth Minded Athletes can be Fixed Minded Language Learners. Over time: Mindset is a habit. It too can change and be changed over time. Learning relies on chunking and habit formation; a basic physiological process. Ability/intelligence is actually highly domain specific. Chess masters are good at chess but novices at general memorisation tasks. Reaction times in one sport (e.g., table tennis) do not generalise to other sports (e.g., tennis). The main differentiating factor in performance is practice. I.e., the 10 year / 10 thousand hour rule. And yet we often use the comfortable “Myth of Talent” to make sense of the world. There is no evidence for meaningful genetic differences at a racial level. In fact >90% of genetic variation occurs between individuals/small populations. Instead mostly a combo of environmental, social, political and momentum factors. We can only see/consciously understand a fraction of the work it took to become an expert. We fail to spot the accumulated impact of many small factors or one small factor over time. The subconscious nature of expertise means we can only describe and report a fraction of it. We assume linear relationships where complex systems and feedback mechanisms are at play. We miss the compounding impact of many small factors or one small factor over a long time. We are terrible at visualising exponential functions. E.g., How thick is a piece of paper after 103 folds? 93 billion light years (as thick as the Universe). We give more weight to information that confirms existing stories. This makes it hard to shake pre-existing biases. We misattribute or find causation where there is only correlation. We are better at remembering surprising or extreme examples. We tend to confuse how easily memorable something is with how likely it is. As a result, we weight extreme examples over “normal” ones in our mental models. We extrapolate results from small to large populations without regard to sample size. We extrapolate performance between one or many domains (e.g., chess >> general memory). Mindset: “Natural talent” based praise induces a fixed mindset in others. “Effort” based praise induces a growth mindset. Practice: In a “Fixed Mindset” we seek confirmation of our innate gift through easy tasks and risk avoidance. So we do not learn. Opportunity: Our biases create self-fulfilling prophecies through both positive and negative discrimination (e.g., black athletes). A “Growth Mindset” gives us a love of learning and a resilience to failure. An “Internal Motive”, once sparked, sets intention and sustains drive and motivation. Anything can spark it but “Motivation by Association” (e.g., through a shared local or national identity) is a powerful example. Once sparked, motive must be “sustained” either internally or by virtue of its own momentum (see Learned Industriousness). “Purposeful Practice” with enough quantity, quality and feedback, is the bedrock of ability. Quantity: “10 year / thousand hour rule”. Consistently proven as biggest single differentiator of ability across all domains. Quality: Practice must be constantly challenging. If something feels easy or subconscious, it is not improving (e.g., driving to work). Feedback: “If you don’t know what you are doing wrong, you can never know what you are doing right”. Must be timely (quick to follow the action), objective and attributable (See “Kaizen“). Try to look for or design feedback loops in your practice (e.g., by standardising procedure). “Good Luck” in Where, When, What, Who and How separates the top 10% from the top 10. Where: In the right place. Determines Who and How. E.g., “Reading” for UK Table Tennis; Eldoret for distance running. When: At the right time. Timing, at the start of an up-cycle, is everything. E.g., Hockey players born early in season cut off. Reading in the early 80s for Table Tennis. What: Genetics, injury. Some genetic factors make a difference sometimes. Injury/burnout can unravel even the most promising career. Who: With the right people. Ourselves, peers, parents, teachers, mentors, coaches, judges – all influence the course of our journey. How: And the right facilities. Tightly linked with Where and When. E.g., It’s hard to be a tennis champion with no tennis court. Our beliefs have a profound and physical impact on our experience and actions (see the Placebo Effect). And it turns out it doesn’t matter what they are (e.g., divine, scientific) so long as our beliefs are sincere. Learning: Openness to criticism, understanding of our own flaws. Performance: Unwavering self-confidence and belief. And believing the wrong thing at the wrong time can greatly disrupt both. Learning: Unwavering self-confidence >> Expert delusion >> Lack of learning (e.g., Emperor’s New Clothes). Performance: Vulnerability >> Analysis paralysis >> Choking. So, the ability to believe in and appropriately manage two conflicting realities is critical to optimising growth. Our ability to improve our intelligence and abilities is more in control than we ever imagined. Luck and genetics do play a role but this is much less significant than we assume. Don’t let the “Myth of Talent” hold you and the people around you back. Get out there and take more responsibility for your own destiny! Don’t let a few weeks of half hearted effort at some skill confirm your false beliefs. Purposeful practice is not easy, it is hard, but it is also mostly available to everyone. Understanding this will not only change you, it will also change those around you. “Outliers: The Story of Success”, Malcolm Gladwell: Heavily referenced by Syed and for good reason. Gladwell’s pursuit of the truth is relentless. His book deeply debunks “The Myth of Talent”, including many deep and widely held biases, across a wide range of domains. Incidentaly, his new podcast “Revisionist History” is also fascinating. See the book summary here. “Mindset: How You Can Fulfil Your Potential”, Carol Dweck: Another primary source for Syed. Dweck’s decades of experiments and insights into the psychology of learning have deeply influenced today’s thinking on the topic. The idea and evidence behind “Growth” and “Fixed” mindsets began and come from here. A fascinating read. See the book summary here. “The Art of Learning: An Inner Journey to Optimal Performance”, Joshua Waitzkin: Waitzkin’s book tells the story of his rise to both International Master at Chess and a World Champion in Taichi Push Hands. His first hand insights of mastering not one but two domains to a World Class level make for fascinating reading. A wonderful and insightful book. “Deep Work: Rules for Focused Success in a Distracted World”, Cal Newport: In this fascinating book, Cal Newport guides us into the requirements, benefits and importance of “Deep Work”. His concept overlaps almost perfectly with the idea of “Purposeful Practice”. For anyone looking for more practical tips on single minded progress, this is a must read. See the book summary here. “The Power of Habit: Why We Do What We Do in Life and Business”, Charles Duhigg: If you’re looking for more on the power of the subconscious then try this book for size. An amazing insight into the importance of habit in every aspect of learning. Also full of practical tips. See the book summary here. “A Mind For Numbers: How to Excel at Math and Science”, Barbara Oakley: My final reading suggestion is another fascinating journey into the physiology and psychology of learning. Barbara’s book is as deeply practical as it is informative. If you’re looking for more on Chunking, Discipline and Creativity then look no further. See the book summary here. On the constancy of working memory at 6 – 7 items. E.g., SF who learned to remember up to 87 numbers with practice but was unable to recall more than 6 – 7 random consonants (i.e., he was using mnemonics and chunking for the numbers). Same again with Chess Grand Masters – they are no better than novices at remembering board configurations that do not appear in natural game settings. Awesome post! I’m from Brazil and also a fanatic of learning techniques! Thank you for sharing your thoughts and contributing to the making of a better world! Thank you, Ludwig, I’m very pleased it helped and touched by your comment. Have you read my guide to Memorisation and Spaced Repetition? You’ll enjoy it. Also, check out Josh from The ArtOfMemory’s suggested resources in the comments section. Really helpful stuff.